Why wear a clip-on tie? A perfect necktie knot every time. All you have to do is snap the lever onto the shirt collar and you're done and ready to go. You don't have to wrestle with tying a necktie so you save time, energy, and frustration. It's great for adults, kids, and anyone who isn't able tie their own tie. What are the safety benefits of wearing a clip-on tie? You can never be choked, grabbed or dragged by your clip-on tie. The moment the clip-on tie is tugged with a minimal amount of pressure, the tie immediately comes off. Our necktie clips are the number one choice of law enforcement and security firms worldwide. What is the proper way to put on a clip-on tie? To put on a clip-on tie, insert the metal lever over the top of the shirt collar. Then press the necktie knot down on to the collar. Where can I buy a clip-on tie made with your clip? Clip-on neckties made with our clips are available in stores nationwide, as well as from uniform suppliers. To be sure that you are purchasing one, just look for a necktie with our trademarked logo stamped on the tip of the clip lever. Yes, about 50% of our customers are overseas. Can you drop ship to China? Yes, we can drop ship to China. We already do this for some customers. Please contact us for more information. Why don't you accept credit cards? We sell to neckwear manufacturers and since we are a business to business supplier and not a retail operation, we do not accept credit cards. What advantage does your clip have compared to a cheaper copy? We are the original and most well known in the necktie clip business. We make the best quality necktie clip and we stand by our products. That is why we proudly stamp our logo on our levers and emboss the plastic with our company name. And because we emboss our name on the plastic wing of the clip, if the necktie falls off of the clip, the consumer only sees our company name. There is no brand to look up so we are the only source that the customer has. We receive calls from consumers who have neckties that have fallen off of the clips. And although the necktie is not our product and we did not participate in the clip-on tie manufacturing process, we still provide service to the customer and re-attach the clip to the necktie for them. The inferior copies have no identifying marks because they don't want you to know who made them, so there is no back up service. Why are zinc plated clip levers healthier than nickel? Many necktie clips are plated with nickel. Studies have found that nickel in direct and prolonged contact with the skin produces allergies. In 2001, the European Union banned the use of nickel plated products that come in contact with the skin. As part of our commitment to produce safe and high quality products, we changed our production to only zinc plating, which is considered much healthier. 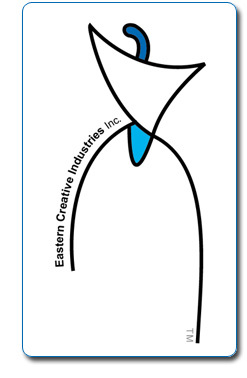 ECI was incorporated in 1971 and has successfully been in business ever since. How have you stayed in business so long with all the Chinese copies in the market? Anyone in the neckwear industry knows that it's a tough and cutthroat business and new companies open and close each year. Our formula for success is our dedication to bringing new and innovative necktie clips to the market and our commitment to outstanding quality and service. That is why we have been the leader in necktie clips and the best known in the industry. Can you teach how to make a clip-on tie? Yes, as a service to our clients, we teach the tying method and the manufacturing process. We help our clients to improve their set-up so that they can make clip-on ties precisely and efficiently. Can I buy your clips in sewing supply stores? No, we do not sell directly to any retail outlets. As necktie clips are a very specific product and somewhat complicated to manufacture, they are not available in sewing supply stores.